Kevin O'Brien blazed the fastest century in Cricket World Cup history as Ireland pulled off an astonishing victory over England in Bangalore. He smashed 113 off 63 balls as Ireland recovered from 111-5 to overhaul their target of 328 with five balls to spare and three wickets in hand. Earlier, fifties from Kevin Pietersen, Jonathan Trott and Ian Bell had driven England to an imposing 327-8. But O'Brien's stunning assault powered Ireland to a famous triumph. 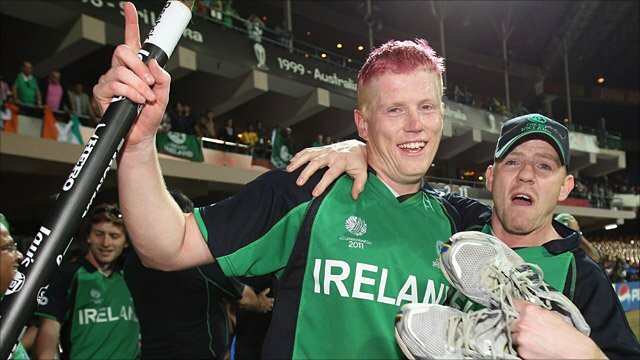 Only three days after England's thrilling tie with India, Bangalore's M Chinnaswamy Stadium played host to another of one-day cricket's most dramatic encounters as Ireland produced the highest run chase ever at the World Cup. O'Brien, a 26-year-old all-rounder who had never made a fifty in nine previous World Cup innings, turned the match on its head with a brutal display of hitting featuring 13 fours and six sixes and a partnership of 162 with Alex Cusack. Dropped on 91 by England captain Andrew Strauss, he went on to reach his century off 50 balls, 16 fewer than the previous tournament record set by former Australia opener Matthew Hayden. And although O'Brien was run out in the penultimate over, John Mooney was on hand to smash the first ball of the last over for four and spark delirious celebrations in the Ireland camp. "To see any team win from that position is quite something but when they are the underdogs it is something truly special," said BBC cricket correspondent Jonathan Agnew on Test Match Special. Former England batsman Geoffrey Boycott added: "It's disappointing if you are an England supporter but Ireland were absolutely fantastic. Not only did O'Brien produce an incredible knock, the tail-enders held their nerve to see them home." For England, the defeat will lead to plenty of soul-searching as they look back on another disappointing bowling and fielding display. Even before Strauss's drop ruined the England skipper's 34th birthday celebrations, Matt Prior, James Anderson and Michael Yardy had all spilled chances that should have been taken. In the batting department, England's top four laid a formidable platform but once again the middle order failed to keep up the momentum when a score in excess of 350 looked on the cards. Despite those misgivings, few will have given Ireland a chance of chasing down 328 to win and even fewer will have been backing them after they lost a wicket from the very first ball of their reply. Anderson - under pressure after conceding 163 runs in the first two matches - had Will Porterfield bowled off an inside edge. The Irish made an impressive recovery and kept up with the required run rate for the first 10 overs thanks largely to some lusty blows from Paul Stirling. 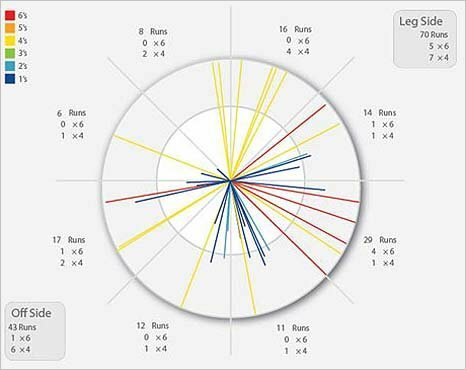 The 20-year-old opener smashed five fours and a six before a top-edged pull off Tim Bresnan was well-held by Pietersen. Niall O'Brien and Ed Joyce rode their luck in seeing Ireland to 103-2 before a devastating burst from Graeme Swann put England in total control. O'Brien missed a slog-sweep and was bowled, Gary Wilson was trapped leg before wicket and Joyce was stumped for 32 to leave Ireland seemingly in tatters at 111-5. But then came the Kevin O'Brien show as the all-rounder - whose only county cricket experience came with Nottinghamshire in 2009 - treated the crowd to a brutal display of power hitting. His half-century off 30 balls featured successive sixes off Swann and a pull off Anderson that cleared the ropes by some distance. And it did not stop there as a ball from Bresnan was drilled over cover point for another maximum, and Anderson was heaved over long-on for the biggest six of the tournament so far as O'Brien added 30 more runs of his next nine deliveries. At the other end, Cusack played a brilliant supporting role as Ireland started to think the unthinkable. Cusack's run out for 47 in the 42nd over briefly gave England hope but Mooney kept the momentum going with some sensible batting. O'Brien's dismissal brought Trent Johnston to the crease and the veteran all-rounder smashed his first ball for four to move the Irish within seven of victory, paving the way for Mooney to crack the winning runs. Earlier, Strauss and Pietersen had made the most of some relatively tame bowling in steaming to 72-0 off 10 overs. England lost their first wicket in the 14th over when Strauss attempted an elaborate pull off 18-year-old left-arm spinner George Dockrell but missed the ball and was bowled round his legs. Pietersen breezed to his 21st one-day fifty before emulating his captain by succumbing to a dismissal that was entirely of his own-making. Slightly off balance as he attempted a reverse sweep to off-spinner Stirling, he simply dabbed the ball into the air, gifting wicketkeeper Niall O'Brien the simplest of catches. Bell made a curious start to his innings, struggling for his characteristic timing before finding the boundary with a pair of lofted drives and accelerating past 50. Just as against India, Bell's demise came during the batting powerplay as he tried to force the pace and cracked a low full-toss to midwicket, where Stirling claimed a low diving catch to his left. Trott, having played his normal no-frills game to reach 92, took his first risk with a wild swing at a full delivery from Mooney and was bowled. In an untidy finish to the innings, Paul Collingwood found his range with a huge six over long-on before attempting to repeat the shot and getting caught on the boundary before Prior and Yardy both had their stumps re-arranged. Some textbook death bowling from the Irish restricted England to 15 runs from the last three overs, with Bresnan caught in the deep off the final ball of the innings.